Chris hails from Bundaberg in Queensland. The youngest of 10 children, Chris experienced first-hand many of the issues faced by Indigenous students throughout their schooling. Entering university Chris found encouragement and inspiration from various lecturers and mentors who encouraged him to go beyond the expectations the system usually held for young Indigenous students. He completed a Diploma of Teaching, a Bachelor of Education and a Master of Education. In recent years Chris completed a PhD in Psychology with Murdoch University. In the late 1990's Chris took on the challenges of Indigenous education as the Principal of Cherbourg State School in South East Queensland. Through strong leadership and clear vision he facilitated many changes at the school which saw increasing enthusiasm for student learning through dramatically improved school attendance and increased community involvement in education. 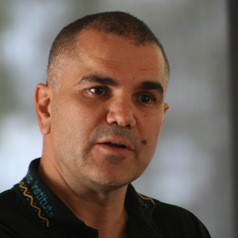 Under Chris' leadership the school became nationally acclaimed for its pursuit of the Strong and Smart philosophy, espousing a strong and positive sense of what it means to be Aboriginal in today's Australian society and that Indigenous students can achieve outcomes comparable to other students. Chris has been the recipient of many awards and much recognition as his ideas, enthusiasm and vision have taken hold nationally and internationally. Chris believes that the power teachers have to inspire their students should never be underestimated. These are messages that Chris Sarra has drawn from his own life - as an Indigenous child, student, teacher, parent, principal and leader. Strong and Smart: Towards a Pedagogy for Emancipation; Education for First Peoples, Routledge, London. UK.